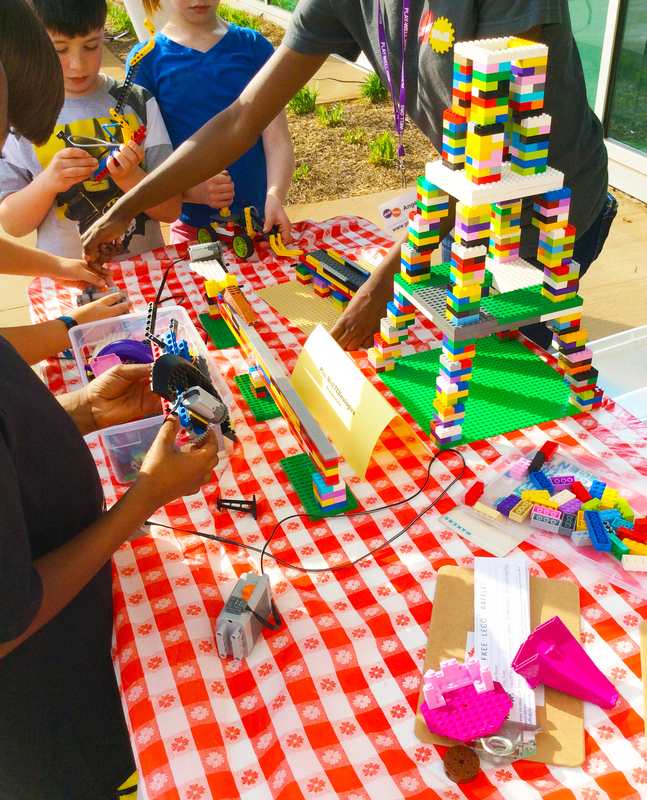 Students build with Legos during a Designorama event at Drew Charter School, a former Maker VISTA partner site. After five inspiring and challenging years, the Maker VISTA program has concluded. Each of our VISTA members, working at various partner sites nationwide, came to this program with different perspectives, and focused on different projects—yet they all remain connected by a steadfast commitment to service and community. To celebrate the five years of this program and its end, we’re sharing some reflections on the impact of Maker VISTA and our hopes for the future. Some recurring questions we hear about the Maker VISTA program have been: “What do Maker VISTA members actually do?” or, “What does ‘building capacity’ actually entail?” and, “What can a Maker VISTA member provide?” VISTA members, in short, are a resource, and they create resources. Maker VISTA members immerse themselves in a community, at a school site or within an organization, and act as an essential human resource. They cover the nuts-and-bolts logistics so their supervisors can focus on big picture issues; or, they can kick off work on those bigger picture issues and projects, now that there’s finally someone to tackle them. They are the eyes, ears, and hands that have been missing; the extra boost of energy and effort needed to really move initiatives forward. They conduct outreach, recruit and train volunteers, train teachers and co-write lesson plans, pilot and prep activities, coordinate events, develop systems and best practices, build buy-in among administrators or stakeholders—and all the while, they also count crayons for inventory, clean glue guns, fix that hangy thing in the 3D printer, document processes, and untangle loose ends of all kinds. They are catalysts, conduits, connectors and conductors. In the last two years, Maker VISTA members have radically evolved the environments of educational spaces across five states, thirteen schools, an entire school district, a university STEM department and six nonprofit organizations impacting over 8,800 students. And that’s just between August 2016 through this very morning. During this timeframe, the efforts and service of Maker VISTA members leveraged donations and granted funds totaling $363,642, along with in-kind resources valued at $130,953. But perhaps the most significant “stat” is one that is simultaneously much simpler and much more complicated: due to the work of Maker VISTA members and this program itself, there is now resonant, responsive making where before there was not. Thanks to this program and the tireless, spirited service members who fueled it, there are STEAM trunks wheeling across two campuses at Drew Charter School in Atlanta, with a reservation system, project guides, website, and training workshops to support their meaningful use. There are PD sessions, customized resources for early-childhood educators, and a slowly but surely changing community mindset in Salmon, ID, one of the most rural towns in America. There are special education middle school students in California’s San Fernando Valley getting hands-on by making their own instruments and building skills through TinkerCad, as vertical gardens climb hallway walls and a new compost initiative takes root out back. There are students, teachers and parents at Grass Valley Elementary School in Oakland, weaving an even tighter-knit community tapestry by using maker-centered education as an agency-building, problem-solving, access-enabling launchpad for reflective, culturally relevant, and richly connected learning. These instances and epic accomplishments are just a glimpse; the list and the successes go on and on. To serve is often to put someone else above and ahead of yourself, and to move your needs aside. Our Maker VISTA members—each and every one of them—did the former, relentlessly. But they brought themselves to every aspect of their work. Their lived experiences, their energy, their embrace of the new and sometimes completely foreign (and impossible) have been vital veins of this program and its work. Our partners—each and every one of them—have met them with respect, with earnest appreciation, with mentorship and investment and guidance. To say that we are grateful for each and every one of them all is an absolute understatement. We are better for having learned from them, and the world is better for having them as citizens and champions. Suffice it to say: Maker VISTA was perhaps just the beginning of what “making” can do, lead to, inspire, revolutionize. We eagerly await the next stage, and future opportunities to engage with and cheer on the many, many makings ahead. To every Maker VISTA member and leader, every partner site and supervisor, the Corporation for National Community Service, and Program Manager who has acted at this program’s helm: Maker Ed thanks you wholeheartedly.